We present four case studies of exceptional wave events of meteorological origin, observed on the Finnish coast in the summers of 2010 and 2011. Eyewitnesses report unusually rapid and strong sea-level variations (up to 1 m in 5–15 min) and strong oscillating currents during these events. High-resolution sea-level measurements confirm the eyewitness observations, but the oscillations recorded by tide gauges mostly have a considerably smaller amplitude. The oscillations coincide with sudden jumps in surface air pressure at coastal observation stations, related to the passage of squall lines or gust fronts. These fronts propagate above the sea at a resonant speed, allowing efficient energy transfer between the atmospheric disturbance and the sea wave that it generates. 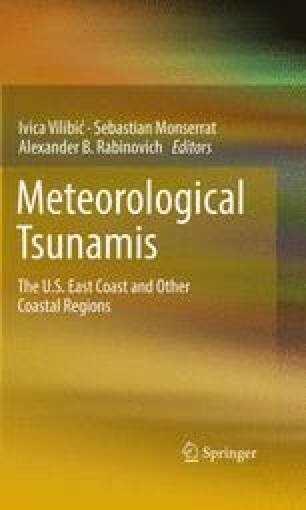 Thus, we interpret the observed sea-level oscillations as small meteotsunamis, long tsunami-like waves generated by meteorological processes and resonance effects. We thank Pentti Pirinen for providing the air pressure data and Hilppa Gregow for encouragement as well as comments on early versions of the manuscript. We would also like to thank Philip Woodworth, Alexander Rabinovich and an anonymous reviewer for thoughtful comments on the paper. This work has been supported financially by the Finnish Ministry of Employment and the Economy, as a part of the Finnish Research Programme on Nuclear Power Plant Safety 2011–2014 (SAFIR2014).